The story of how I met Hugh MacLeod and he SIGNED MY BOOK! A few months ago I got this book called “Ignore everybody. and 39 other keys to creativity.” and I read it in one sitting. and then I read it again. and then I showed it to everyone I know. And then I read it again. I loved it as much as nearly as much as I love johnny depp. The author Hugh MacLeod became my hero. The man made me want to be a better person, with his awesome advice such as “Never try to sell a meteor to a dinosaur. it wastes your time and annoys the dinosaur.” AND “Quality isn’t job number one. Being totally f*cking amazing is job number one.” (except he didn’t use a star in the F-word, like I did – he’s a little bit cooler than me). because I love him so much, I facebook-stalked him. and then I twitter-stalked him. and one time I tweeted about how he was my hero, and he @ replied! 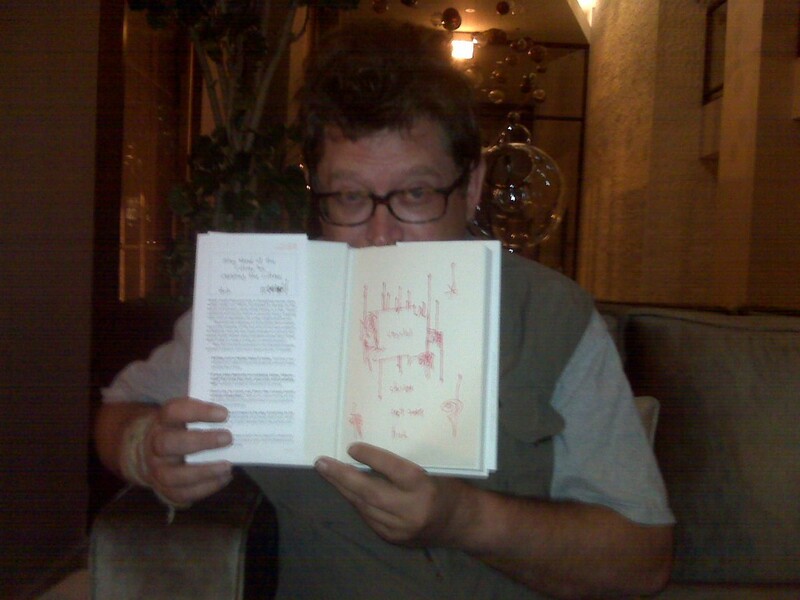 #Chicago #Tweetup tonight with @gapingvoid and @vinnywarren: Felix Hotel (at the bar). 111 W. Huron (@ Clark) 7pm. holy crap. I LIVE by chicago! I could totally go to that!! for about three seconds, I worried about imposing on some sort of close-door meeting meant only for his real-life friends, so I Facebook-ed him to be sure it was an open invitation. I pulled out the dangling silver earrings, a lovely purple top and greet heels. All I needed was my voice. Not like, my “writer’s voice.” My actual real voice. Laryngitis had left me sounding like a bar whore who’d been living on a pack a day for 43 years while also regularly attending rock concerts. I was scratchy and squeaky and awful. I drank hot tea, refused to talk to anyone all afternoon and hoped for the best. Everyone assured me that I sounded like a jazz singer, which helped (ish) but even still, I kept pretty quiet and mostly just looked around in wonder and amazement, while everyone told WAY cooler stories than anything I could come up with. And anyway, my secret plan really was just to get Hugh to sign my book. I didn’t want to look crazy though, so when I came in, I hid it in my coat. (I’m sure the large square-shaped thing in my pocket was TOTALLY sly). Not only did Hugh sign it though, he also drew a picture! (this is exciting because he’s a cartoonist). I’m pretty sure he just got a new fan for life. First, thank you God in Heaven that it is not MY computer that is messed up. I really was dreading this day. well, obviously, i made it through the week with just .